Driving home through heavy fog last night. Trying to capture the glow of sodium streetlights on the road. Streetlights on a foggy autumn night, 30 March 2014. Looking out my kitchen window I could see a light in the next street and my neighbours trees silhouetted against the light. 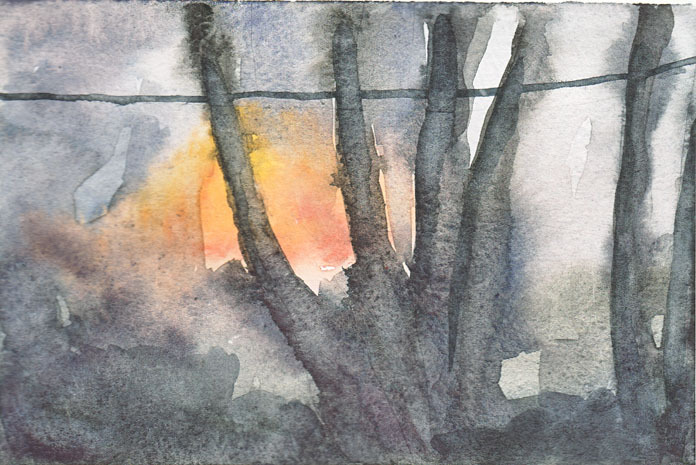 Light in the next street, trees and powerline, 30 March 2014. It has been fairly quiet this week. I’ve been working on exhibition applications of my own and also with friends so there hasn’t been too much going out and about. I did have a quick coffee at the National Portrait Gallery, one of the newest national institutions in Canberra. They have a very welcoming attitude and encourage drawing and community participation. Napkin and condiment box at the National Portrait Gallery of Australia, 24 march 2014. 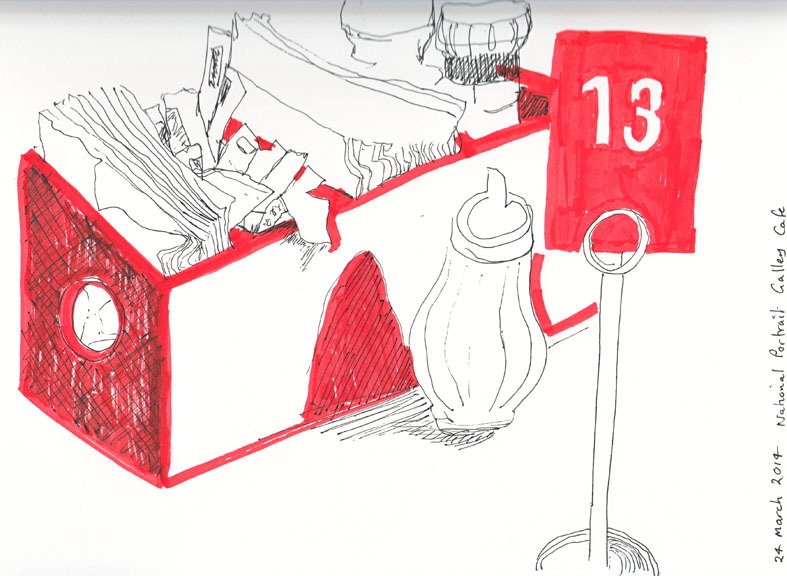 I had my red paint marker in my bag so the red box and table number just begged to be drawn. Back to the Bakery the next day, looking up the street in the opposite direction to my last Bakery drawing. 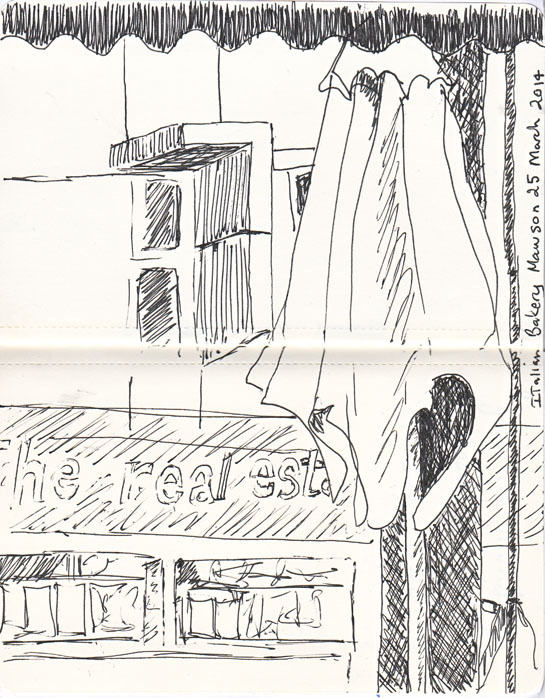 View from the Italian Bakery, Mawson, 25 March 2014. I bravely decided that I didn’t have to use my red paint marker in all my drawings. I have a season pass to the Gold and the Incas exhibition, at the National Gallery of Australia. I like being able to spend time having a good look at one or two individual works in detail. I do this by drawing them. 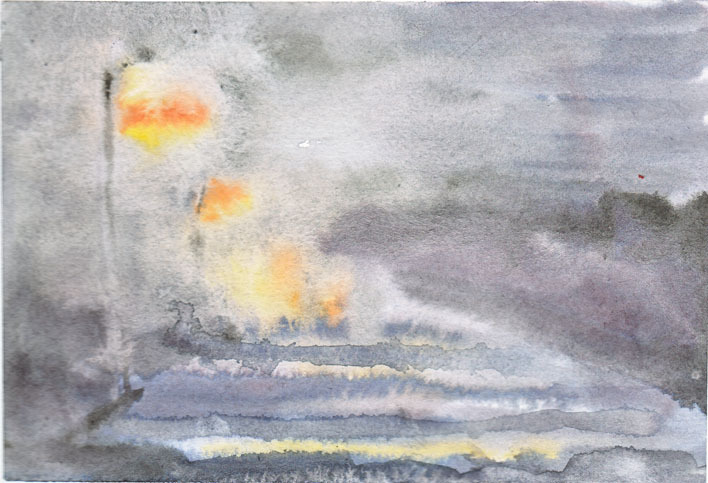 However drawing is proving very challenging in the low-light conditions in the exhibition. For a lot of the time while I was making these drawings I couldn’t actually see the tip of my pencil on the page. This visit I drew two ‘stirrup’ vases, (they get their name from the shape of the handle), although this is clearly not what their makers, the Moche people called them* because stirrups were not introduced into South America until the Spanish invasion, some 800 years after these pots had been made. Both of these works come from the Museo Larco, in Lima, Peru. Some highlights of the Museum ‘s collection are also accessible through the Google Art Project, which is both in English and Spanish. Most striking in the vases on display are the portrait vases, where faces are deftly sculpted in the round and painted in strong colours. Moche vase, portrait head, 100-800 AD, ceramic, from the collection of the Museo Larco, Lima, Peru ML000267. 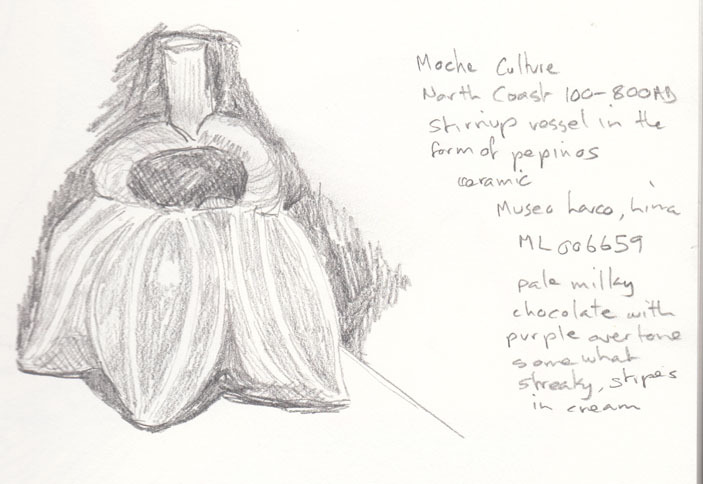 I also made a second drawing of another Moche pot in the shape of four pepinos. The symbolism of the four melons is believed to be related to the four cardinal directions. Moche culture, vase in the form of Pepinos, ceramic, from the collection of the Museo Larco, Lima, Peru ML006659. I particularly enjoy the colours used on these pots so once I got home I scanned and printed out the pictures I had drawn and then I indulged myself with a bit of good old-fashioned colouring in. 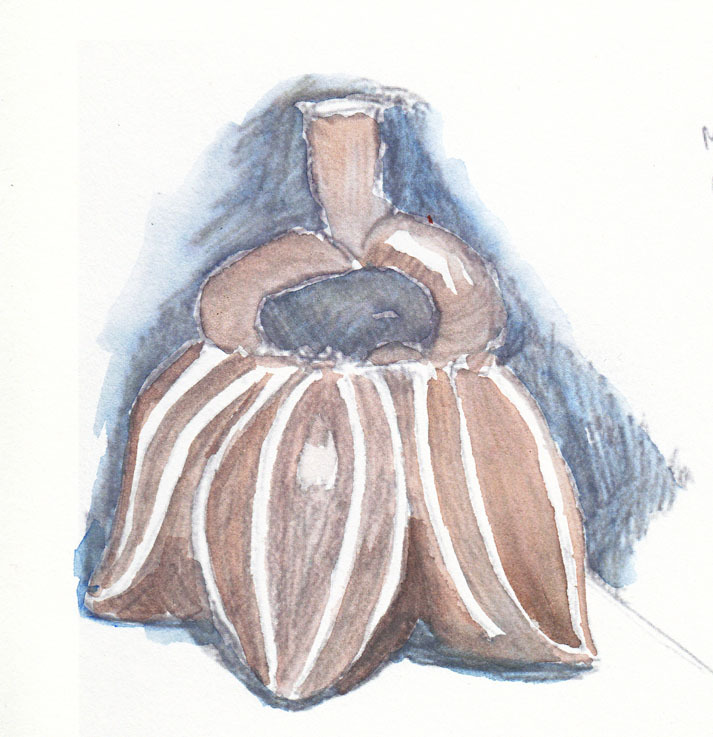 Moche pot with pepinos, 24 March 2014 watercolour. The coloured stripes on the face in the next image are not shadows. The face actually has two colours, umber on one side and a burnt sienna on the other, painted over the glazed terracotta and provide evidence of painted facial decoration. 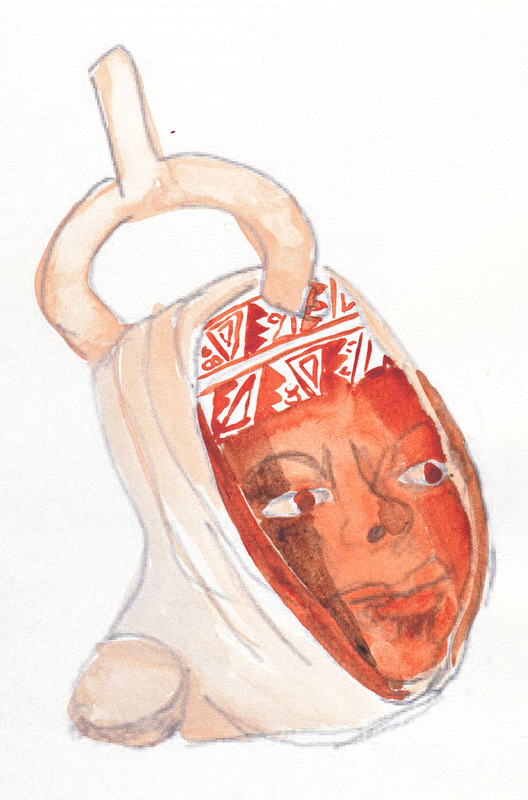 Moche portrait pot, 24 March 2014, watercolour. 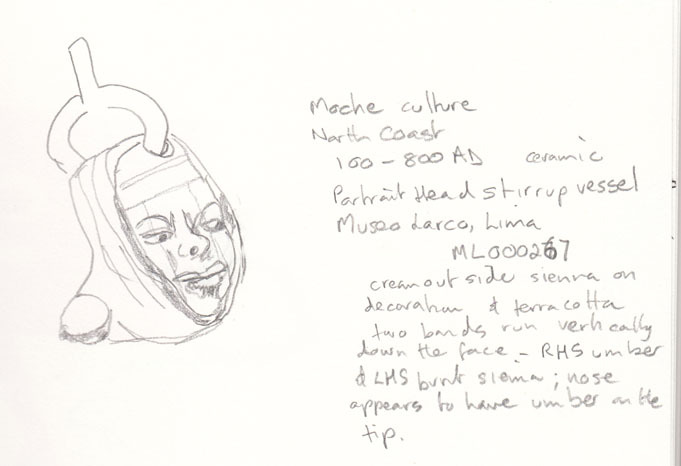 *Actually the Moche pots are referred to as pacchas in the exhibition catalogue. These are ritual objects, also made in materials other than ceramics, which generally consist of a form that conducts or conduits liquid through them. These vessels were used in life and were also buried with the dead. Their symbolism is related to the connection between the exterior and interior ‘worlds’ that meet during rituals and at the moment of death. The statue of Shiva, Lord of the Dance (Nataraja) at the National Gallery of Australia (NGA), has been danced into a controversy with what appear to be convincing allegations that the statue was stolen from a temple in Tamil Nadu, India. The allegations have also contributed to the resignation of the Director of the Gallery, Mr Ron Radford. So with heightened interest I took the opportunity to make a ‘blind drawing’ of the statue while visiting the NGA today. Shiva as Lord of the Dance (Nataraja), 11th-12th century AD, bronze, National Gallery of Australia (well for now anyway), 24 March 2014. This truly is an amazing work of art and devotion. The more I studied the statue the more the slender limbs came into focus. On each of the arms and legs bracelets and anklets adorned the moving figure. 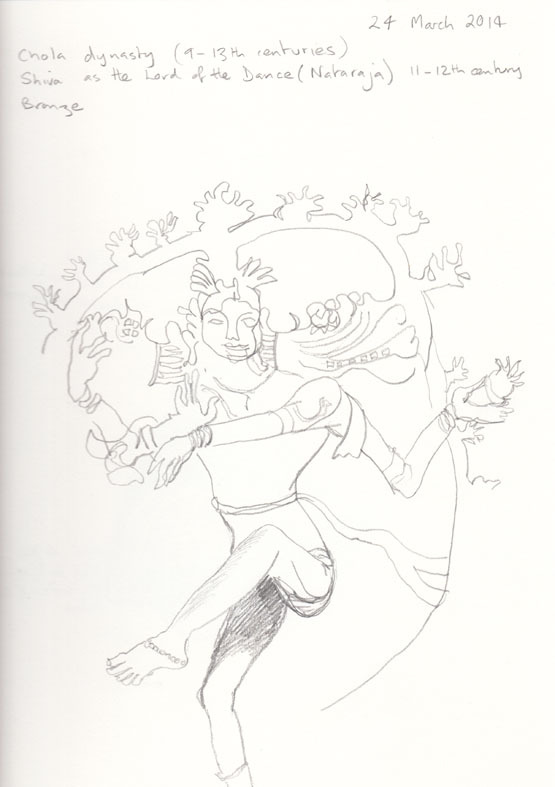 Shiva’s raised foot, drawn from the rear of the sculpture, 24 March 2014. This is a work that clearly evokes deep feelings, even in people from outside of its originating culture, so to consider the negative impact of its theft from a place of worship is disquieting to say the least. I strongly feel that the statue should be repatriated as a matter of urgency. Only two days after I drew the Shiva Nataraja at the National Gallery of Australia, the sculpture has been removed from display. This follows the Australian government receiving a formal request from the government of India for the return of the statue. The ABC TV program Four Corners on Monday also aired a program looking at the case of this sculpture and raising doubts over the purchase of a number of other works by both the NGA and the Art Gallery of New south Wales from the same dealer. The dealer is currently under arrest in India. It’s early days working with my new paint markers. I took several colours with me when I went for coffee on Saturday morning, being mindful that I didn’t want to ‘paint’ my subject, just sketch it. The view is out the bakery window and looking at the back entrances of the shops across the road. 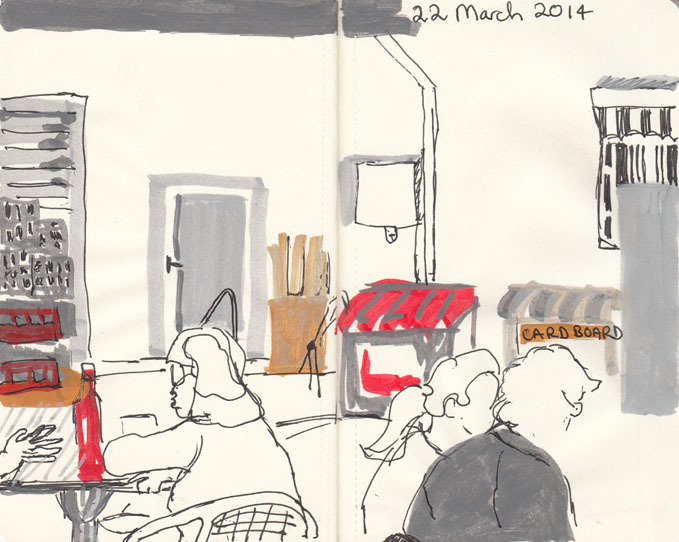 The Italian bakery, 22 March 2014 pen and paint marker. As my partner commented the trick is not to lose the drawing amidst the colour. I’m not sure that I have the balance right yet. I also scanned this image in ‘grayscale’ to give me an idea of how my tonal values are working. It’s something I hadn’t thought about before and I’ll probably do again. If anything it probably reinforces the benefits of limiting my colour palette. 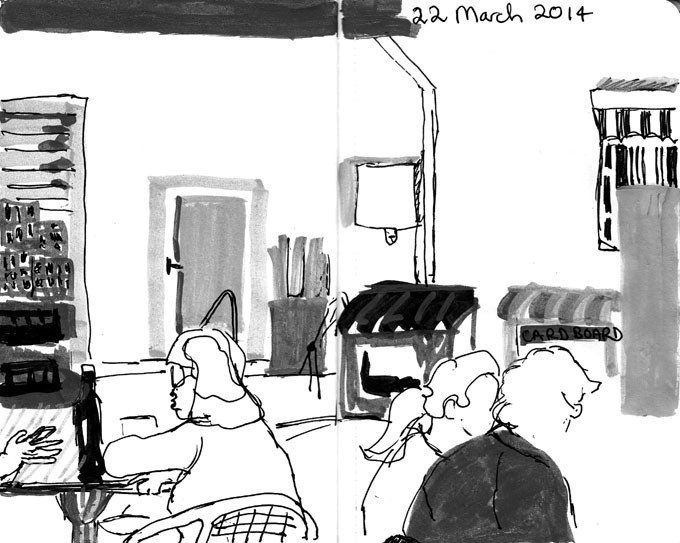 ‘Greyscale’ version of the Italian bakery, 22 March 2014. Yes I have gone out and bought myself several more paint markers. I’m pretty much sticking to the tried and true colours, including a cadmium yellow, cerulean blue and yellow oxide. I’ve also selected a bright green, a lighter blue and two greys. Liquitex paint markers, testing for colour and opacity. The two colour patches were done using wet over dry and as you can see these colours are quite opaque. There are several colours in the range which are transparent but I haven’t tried any of those yet. The other aspect I like about these markers is that they are very quick drying. So that is a plus for my sketching. 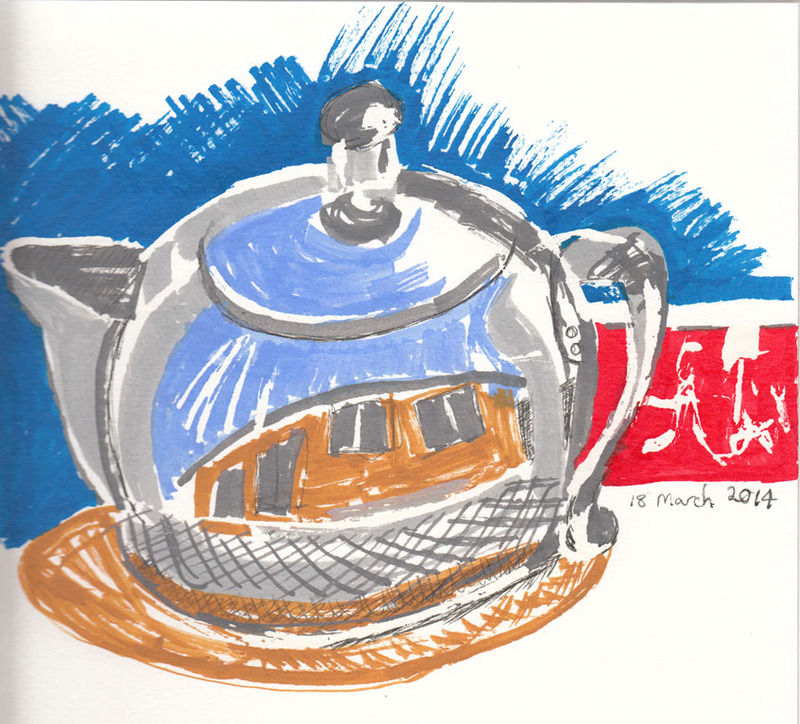 I thought I’d better try the colours out in a ‘real’ drawing, so I did the following sketch of my stainless steel teapot, sitting on a table outside. Teapot painted using Liquitex paint markers and ink, 18 March 2014. I don’t plan to use so much colour in my regular sketches, but I’m pleased with how they worked in this quick sketch. These drawings contain evidence of my even newer, newest art ‘toy’, paint markers. I am testing a Liquitex Paint Marker, which is a water-based acrylic paint in a marker-style tube. I have the smaller nib version 2-4 mm, but a larger 8-15mm is also available. It started like this. I dropped by the art supply shop, just before lunchtime on Friday and as I was the only customer there I took the opportunity to ask the staff to give me their views on the range of marker pens that have become so popular lately, particularly for cartooning and graphic art. I haven’t used a felt pen since primary school and at a general starting price of about $10 per pen it’s not the sort of thing I’m going to buy to try ‘on spec’ (‘speculation’ for the non-Aussies out there). I was pleased that I struck two knowledgeable people who could walk me through what was on offer. One of them suggested that apart from the Copic type of marker I should also consider paint markers. Even better, the supplier had given them a whole stack of these pens to test. So they sent me home with my own cadmium red paint marker to play with. En route I dropped in to the local mall, where I spotted just the right type of sign – red! 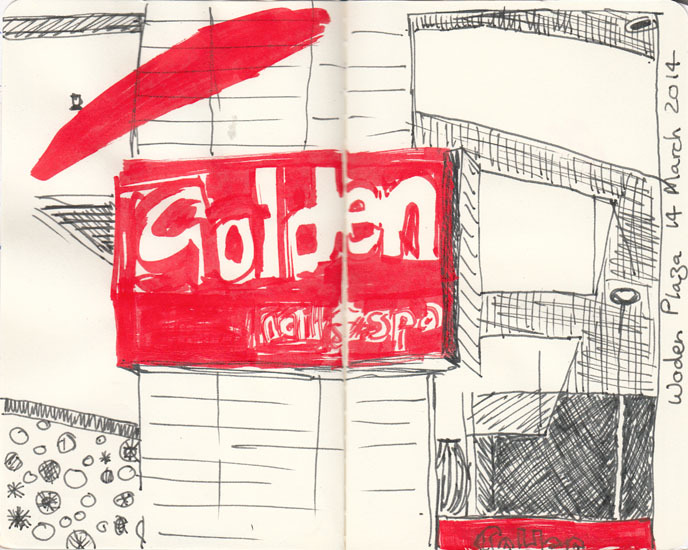 In the Mall, ink and paint marker, 14 March 2014. I did also manage to get in a practice sketch of a some people, without even using the marker pen. 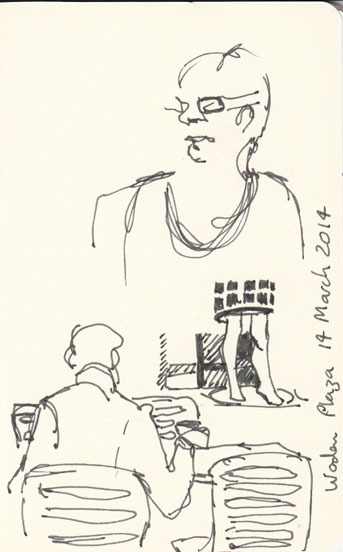 People studies, ink, 14 March 2014. Today I had another chance to use it. Our favourite bakery cafe has been re-decorated, as has the wall on the other side of the road. 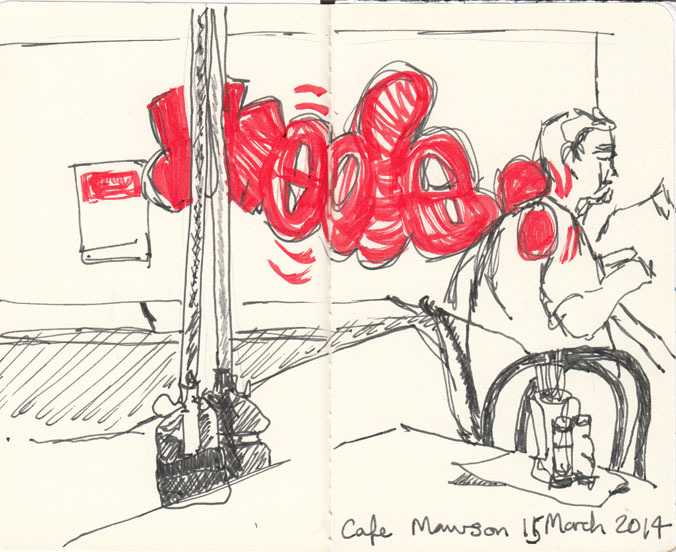 Graffiti outside the cafe, ink, pencil and paint marker, 15 March 2014. The paint marker has a chisel point so it can make quite fine lines as well as thicker marks. It will also give good flat coverage, should you want to do that as well. There are 50 colours available and packets of replacement nibs can also be purchased. 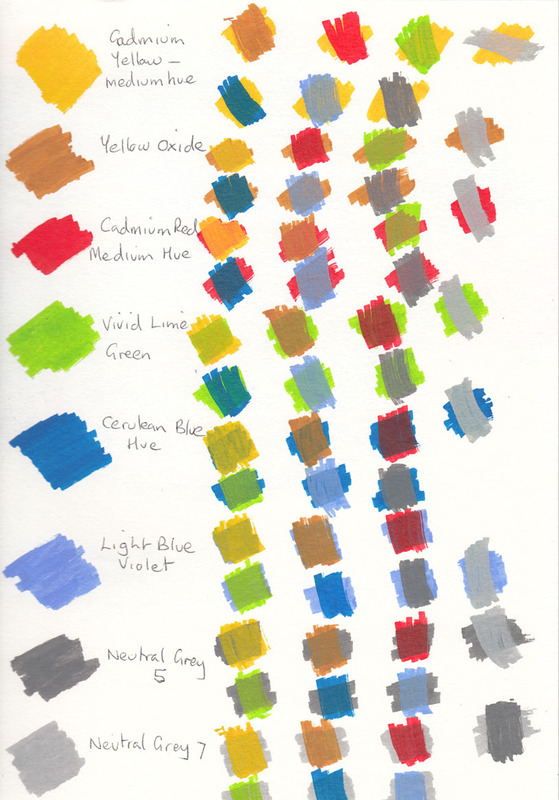 My thinking is that I would like get a few colours, and one or two greys, based on what I normally paint with, in the smaller tubes so I can add them to my ‘field’ sketch kit. The bigger tubes are just way too jumbo-sized to consider taking them with my regular sketching setup. Has anyone else used these paint markers? I’d be interested in your thoughts. I see from their website that Liquitex has been offering a free sample to European and American customers, although UK, US and Canadian requests have apparently outstripped currently available supplies. Anyway keep an eye out for them or ask if your local art shop has some samples you can try.